I am getting ready to travel to Japan this summer to research the ongoing impacts of the Fukushima nuclear accident. I have been awarded a JSPS Fellowship to do Chernobyl-Fukushima comparative research, based at the University of Tokyo. I am really looking forward to seeing how the two disasters compare. For the last few years I have spent long periods in Ukraine interviewing and researching people affected by Chernobyl for a PhD in Human Geography. Having seen how marginalized communities cope with nuclear disaster in Ukraine, it will be interesting to see if similar opinions, views and struggles are playing out near Fukushima. When I mention to people that I am going to Japan, one of the first pieces of advice people give is to make sure I have business cards. I’m told there is a tradition that surrounds business cards in Japan; certain ways of receiving and presenting cards. So I had some made. They arrived today, and I am hoping they will help me make connections when I am in Japan studying the Fukushima disaster. 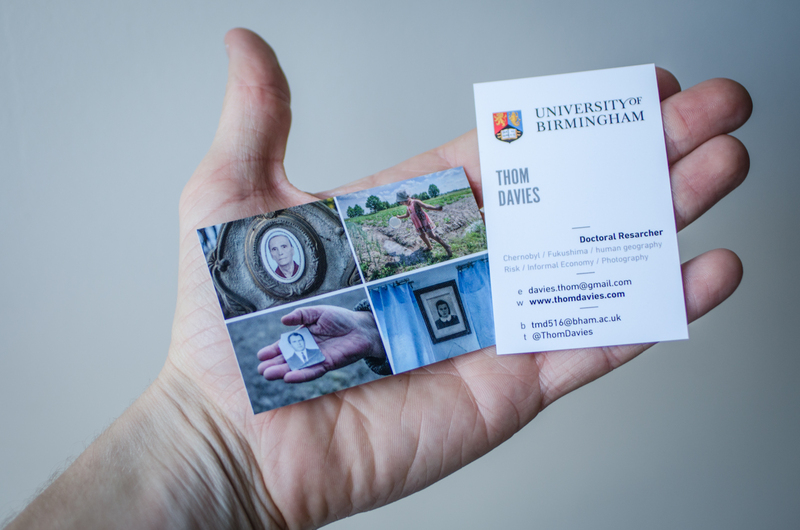 I put four photographs from my War without War: Chernobyl photography project on the back. March 2011: in a village near the main entrance to the Chernobyl ‘Exclusion Zone’ we had pulled-over to listen to the radio. I kept hearing the word “Yaponiya” (Japan) and “atomny” (atomic) from the crackly car stereo. The newsreader then started talking about Chernobyl: “Reports suggest that the nuclear meltdown in Japan could be like another Chernobyl…” I could not believe what I was hearing. Was this really happening? I got out of the car. I had spent the previous week interviewing people who live in the contaminated landscape around the Chernobyl. My head (and voice-recorder) was full of their stories about life after Chernobyl, their daily struggles of life on the edge. My was body full of delicious Ukrainian food I had been given by kind old women and friendly villagers. Standing by the car, in a village near Chernobyl – the radio crackling in the background – I had a very small sense of the confusion and unease that many people felt after disaster. What was the future for Japan? I thought. What was happening? Looking across a field past a few abandoned wooden houses, I could see the contaminated ‘Exclusion Zone’ beyond. Was this the future?